Let’s just take a minute to reflect on what a week it has been for NASCAR. First, Kasey Kahne won the Pocono Race!!!!!!!!!!!!!! YAY!!! We were sooo excited for that win. Helps him in the Sprint Cup Standings to secure a spot in the Championship. Unfortunately, another driver is surely losing his spot in the Championship standings because of an accident. Tony Stewart was in a Sprint Car accident on Monday night that has resulted in him breaking his tibia and fibula in his right leg. Already he has had 2 surgeries to repair the breaks, including a surgery in which they put a rod in his leg. I hope he has a quick recovery and can get back to racing soon. Anyway, when I first started the Sprint Cup Snacks series I had planned on making wine slushies for this weekend’s race at Watkin’s Glen. The Finger Lakes Region of New York is becoming known for their fantastic wines and I have always wanted to have a wine slushy, which they serve up at the New York State Fair. But guess what… if I can’t have a wine slushy now, you can’t have a wine slushy now!!! 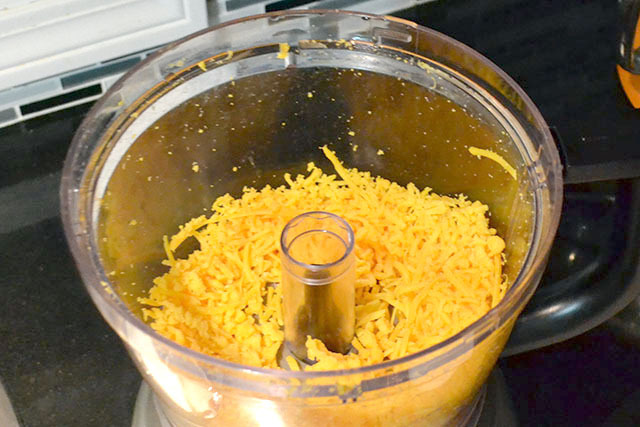 So on to Plan B, which was to make Homemade Cheez-It’s because this race is the “Cheez-It 355 at The Glen”. Oh man, Plan B was such a good idea!! 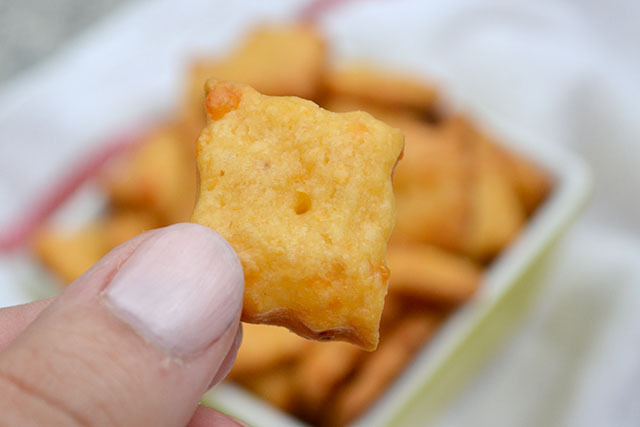 These Homemade Cheez-It’s are just killer. Flaky, crunchy, cheesy, salty, crackers that you can’t resist. 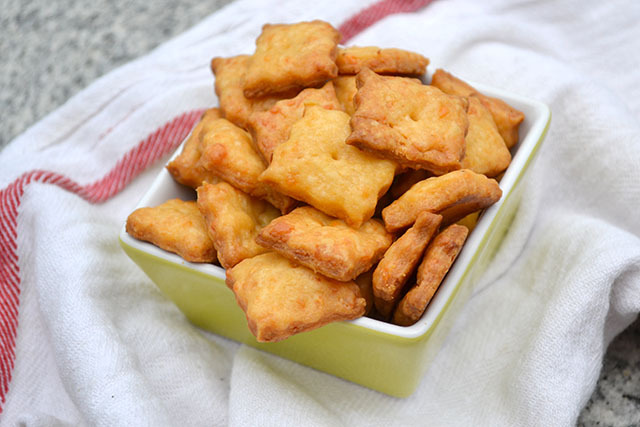 Sure you can just buy a box of Cheez-It’s but you’ll want to give these a try just to prove to yourself that 5 ingredients (plus some seasonings) quickly turn into pop in your month tasty crackers. Plus as they puff up in the oven you get teased with the wonderful cheesy smell drawing you in. 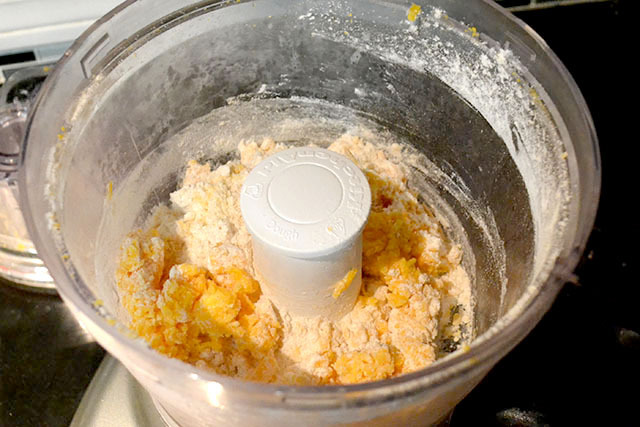 The dough can easily be made in a food processor or in a stand mixer. The key thing is to keep the dough pretty cool so it is easy to work with. 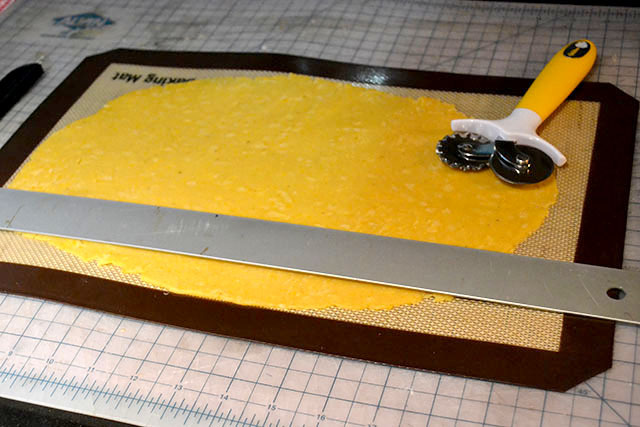 I chilled it every chance I got to make rolling it out easier, cutting easier, and then transferring easier. Get the picture? There are so many melty things (cheese, butter, and shortening) that is is very malleable but very tacky. Since you don’t flour your working surface it is really important to use the silpat/ parchment. Don’t skip that part! I only give these warnings to make the process super easy and fun… and ultimately tasty! Last year we loved watching the race at The Glen from our seats behind Kasey’s pit on Pit Road (!!) so I’ll miss going there this year but at least I have these homemade Cheez-It’s to enjoy while watching the race on Sunday. 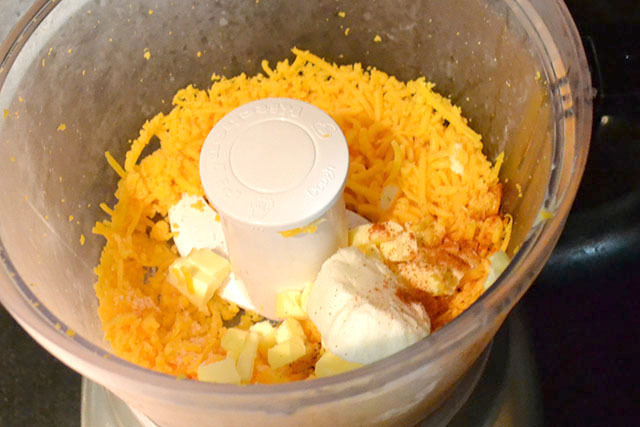 Combine the cheese, butter, shortening, and salt in the bowl of your mixer fitted with the paddle attachment or into a food processor fitted with a dough attachment. The mixture will be crumbly. Slowly add the flour mixing to combine. Slowly add the ice water. You may add a few more drops of water to help it come together but be careful not to add too much as you don’t want a wet dough. 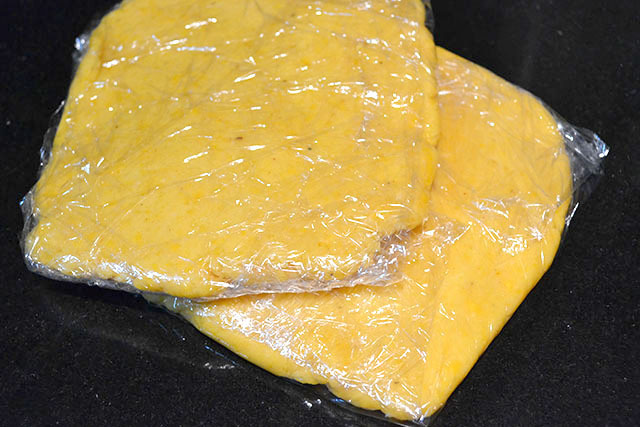 Divide the dough into 2 discs and wrap in plastic wrap. Chill for at least 30 minutes. Bake for 9-13 minutes or until puffed and just browning around the edges. Just be careful not to let them get too dark, it can happen quickly. 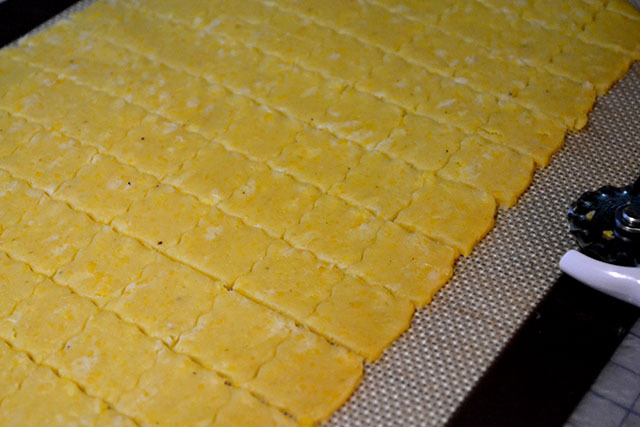 Move crackers to a cooling rack. Landon is OBSESSED with Cheez-It’s. Like, he chose little bags of those instead of chips for his lunches. I guess I should make these! I can’t buy them anymore because I’d eat the whole box and that is just offensive. Was fun to make them tho. Plus now I don’t feel guilty about giving the dof a few burned ones as it’s only a few ingredients. wonder if I can make gluten free? I can’t wait to try these. They look delicious and really cheesy!